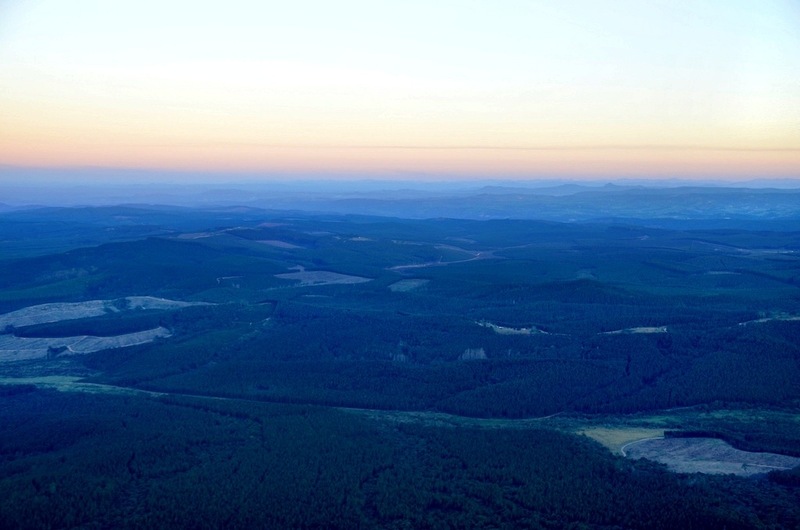 In the northeast corner of South Africa is a seemingly unpronounceable province, Mpumalanga. The name means ‘the place where the sun rises’, a fitting tribute to what must be one of the great natural wonders of the continent; no mean feat in a place with such beauty. It’s also home to one of the world’s great driving routes through fertile valleys, raging rivers and up to soaring mountain peaks – the Panorama Route. 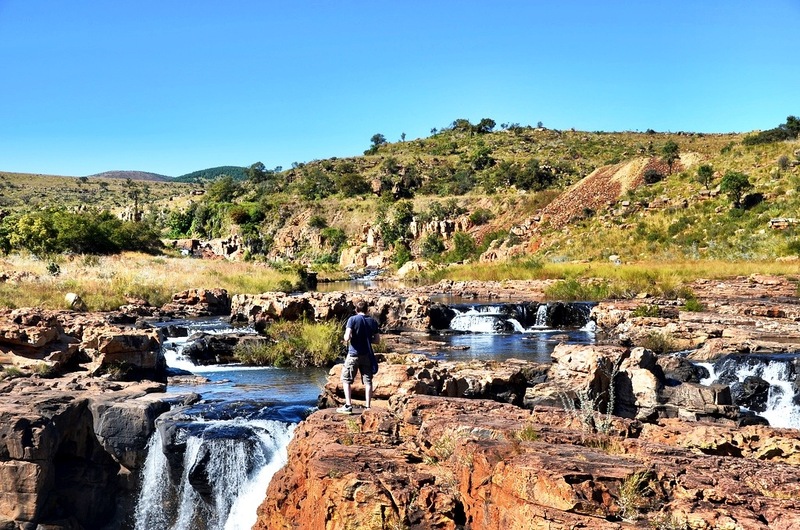 The route is easily reached from Kruger National Park, making it a popular self-drive for the thousands who journey through Mpumalanga every year. I approached it leaving the Nelspruit Airport, and I was one of those thousands who meandered through the beautiful natural monuments en route to the mother of all game reserves. I’ve asked a lot of people, consulted a number of guides and there seems to be no one, clear start and finish to the 285 kilometer Panorama Route. There are definitely key stops that almost everyone agrees are included, but the drive itself is the true joy and not regimentally structured. So for me, the route started underground at the Sudwala Caves, home to the oldest caves in the world. The massive underground chambers have been used for millennia as a place to live and hide, from our earliest ancestors to more modern relatives. But the trip along the Panorama Route didn’t start in earnest until we reached the small town of Graskop, one of the unofficial starts to the drive. An old gold mining town, the major industries in the village today appear to be pancakes and biltong. 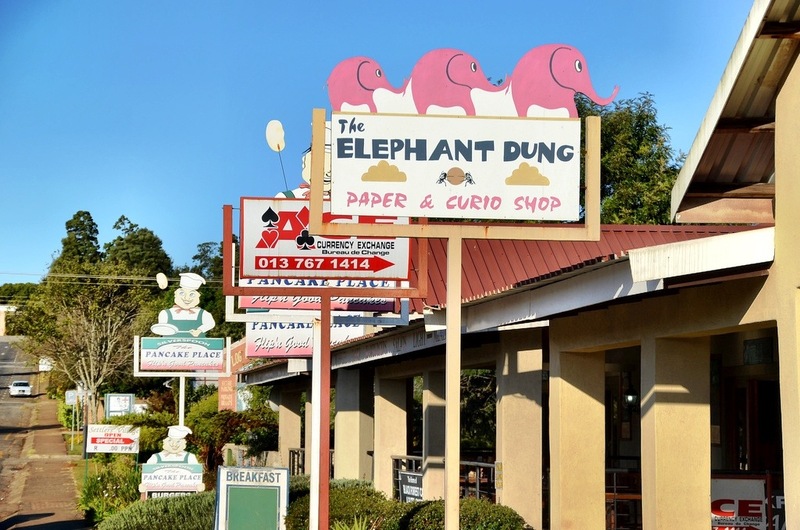 The town is a major tourist stop for anyone going through this part of Mpumalanga either en route to Kruger or to the Route and Graskop has lived up to the need. I’ve never seen so many pancake houses per capita than in Graskop, but as soon as I learned about them I knew I had to try one. I’m used to an American pancake, which is flat and topped with any variety of items. The menu at Harrie’s Pancakes included a variety of sweet and savory options, so I just assumed the pancakes would be loaded for bear. And they were, but not in the way I expected. What arrived when I ordered the bitong and cheese pancake looked more like a crepe than a pancake. The add-ons were rolled up in the thick dough making the perfect lunch really. It only looked like a crepe though, the taste was decidedly pancakish and I was decidedly intrigued. We didn’t have a lot of time, but after lunch I explored town a little to find an equal number of biltong stores for every pancake house. Apparently a unique form of culinary physics is going on in Graskop, but I won’t complain about the results. The fresh, jerky-like biltong snack was a much needed addition to the road trip, as I imagine it is for most people in South Africa. Finally though, after all the pomp and circumstance we were ready to visit our first natural wonder on the Panorama Route, just as the sun was threatening to set – God’s Window. Stopping at the Window actually ticks off several Panorama Route boxes and if for some reason you’re following my own jumbled routing, then it is also your first stop to the Blyde River Canyon Nature Reserve. God’s Window is a popular vantage point along the Drakensberg escarpment, at the southern extremity of the Nature Reserve. But the stop is about so much more than just that. From up here you can see the massive valley, the river, the mountains and I’m told on a clear day you can even look off into the distance and assume you’re seeing not only Kruger National Park, but Mozambique as well. I’m a bit dubious about the Mozambique part, but it’s a beautiful view nonetheless. The Window itself is just a natural viewing point from where you can see beautiful cliffs that plunge down 700 meters to the valley floor. The verdant green plant life is said to remind one of the Garden of Eden, hence the name God’s Window. 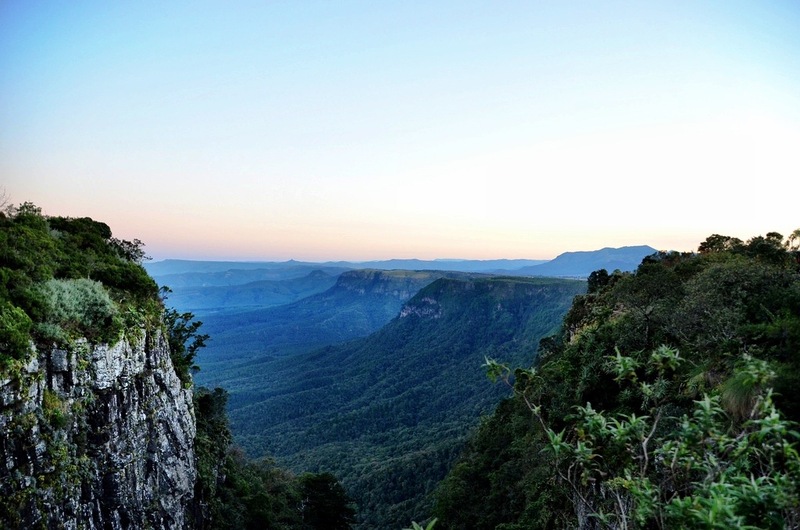 In fact the lush, subtropical vegetation makes the Blyde River Canyon the greenest in the world, and I believe it. It truly is a beautiful spot and I personally think that it’s best seen at sunset. Two other stops awaited us on the second day of driving through the forests of fields of the route: Bourke’s Luck Potholes and the Three Rondavels. 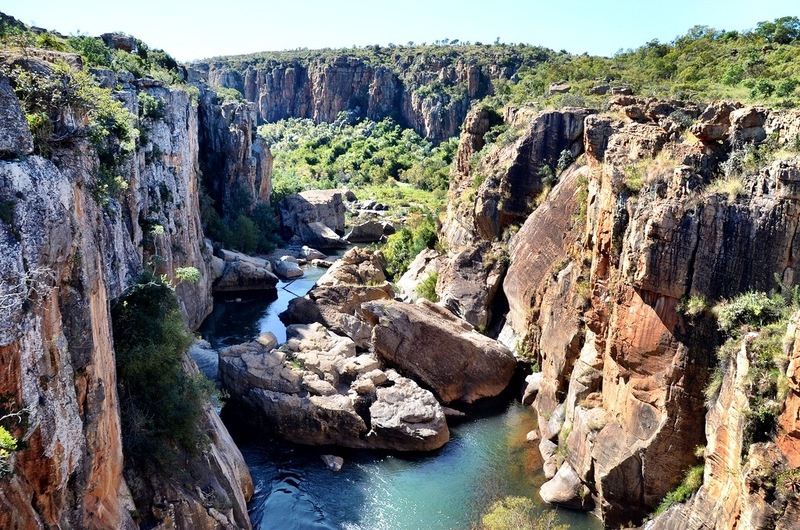 Bourke’s Luck Potholes are one of the most popular features along the Route and was my own personal favorite, even in spite of the unfortunate name. 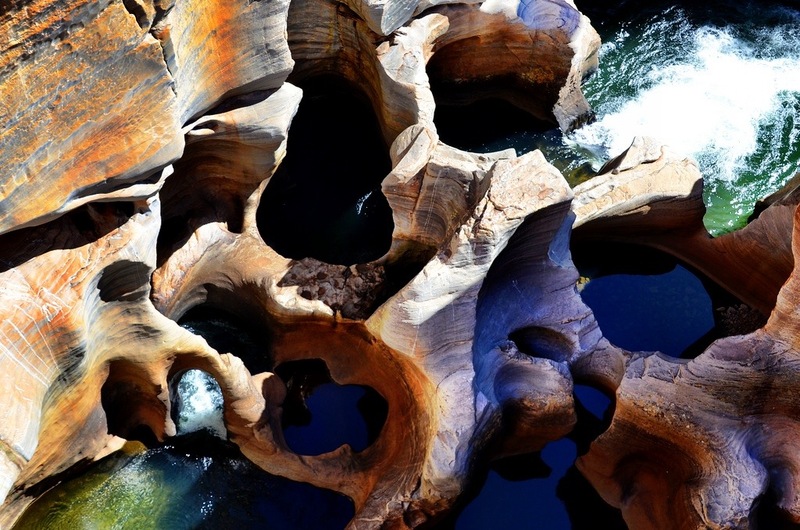 The stunning geological phenomenon sits at the confluence of two rivers, the Treur and Blyde. Physics and geology that I don’t really understand as a result of the rivers and underwater obstacles have, over time, created giant potholes in the landscapes. 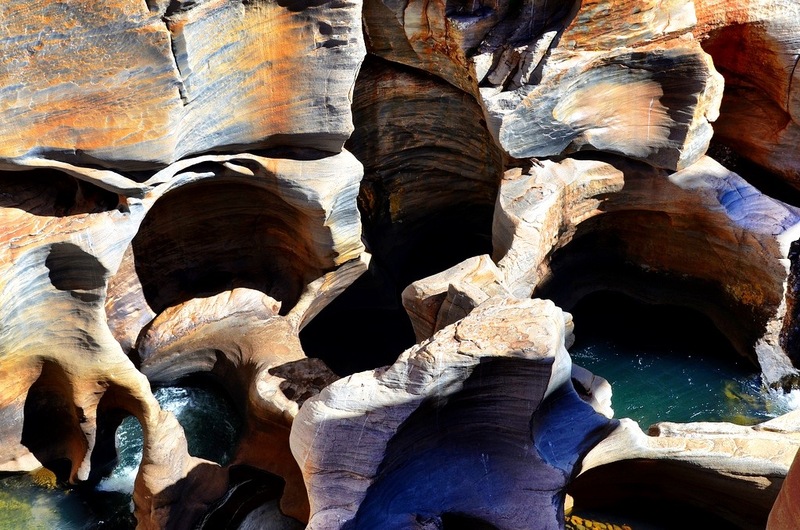 The eroded rocks are beautiful, smooth and look almost designed. I could have stood there for hours watching the water rush over them in a process that has undoubtedly been ongoing for a very long time. Finally, our last stop before the long trek to Kruger was a funny named site, the Three Rondavels. The canyon area along which the Panorama Route follows is big, the third largest in the world and as such there are necessarily many ways to admire the beautiful landscapes it has created. 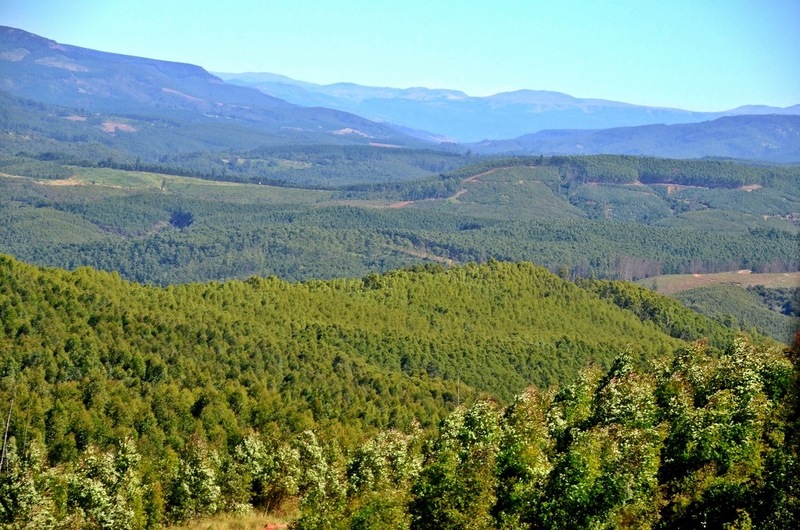 A rondavel is a traditional round African homestead, hence the name for these three mountain tops. Any number of names have accompanied these grassy, slightly pointy tops though, from the Three Sisters to the Chief and his Three Wives. 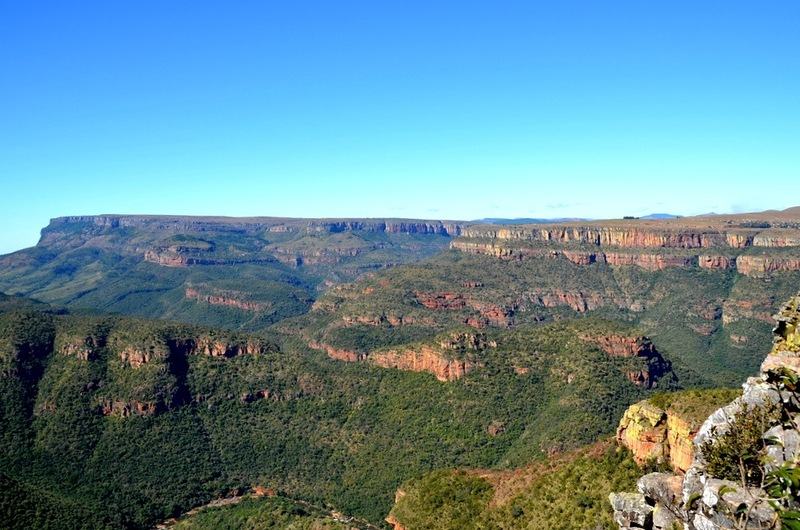 Whatever you call them, the view across the canyon on the other side of the Drakensberg Range is stunning. I realize that almost every stop I’ve detailed here has included the words beautiful, stunning, gorgeous and I’m running out of synonyms. That’s the wonderful problem of driving the Panorama Route, simply running out of adjectives to describe the awesome beauty contained there. As we drove the Panorama Route, time was an issue for us and we just couldn’t visit every spot along the way. The drive though was just as important as the stops. It seemed every corner the car took was met by another breathtaking vista, be it over a valley or across a fertile plain. It was a perfect way for me to spend some time getting to understand the country a little better. I’m a big believer in travel immersion, throwing oneself into a new place and hopefully getting to know it a little better. After a few hours of driving along the Route some of that South African pride I’d come to know and love started to make even more sense. I was also humbled at the size of the country. It took hours of driving to traverse what is really just a small sliver of the country, a tiny example of the width and breadth of the natural wonders contained within its borders. Suddenly I realized that it would take a lifetime to see everything South Africa has to offer, but I also realized that’s something I’m willing to try. Have you done a great scenic drive? Where was it? Highway 1 from Oregon to Mexico is probably my favorite! This looks absolutely incredible though!!! I’m such a huge fan of road trips. Wow, that’s a long trip! 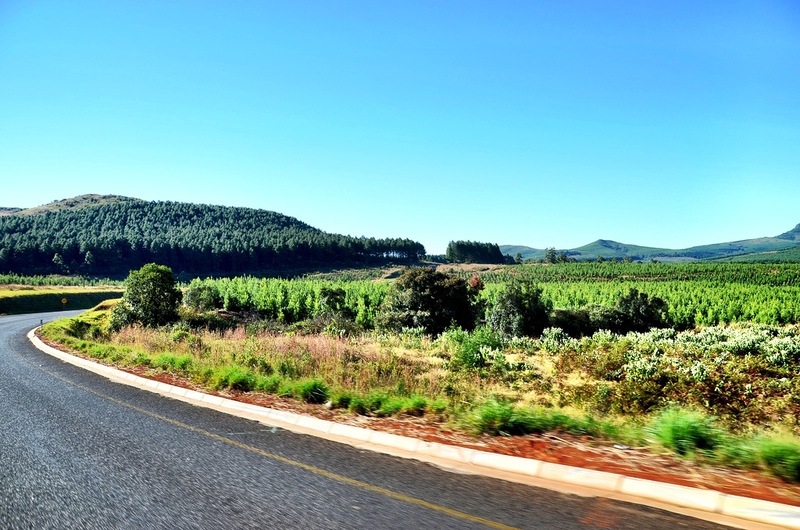 I’m a bit of a road trip junkie and I’ve visited the Panorama Route in a number of occasions. I always get the same feeling I got when driving on the 160 on my way to the Four Corners in USA: An amazing landscape that humbles you and yet undiscovered by the mass tourism. One of those places you want to keep for yourself, specially just before sunset. Once again, you beat me on the post, mine scheduled to go live in a few weeks, but I’m planning to visit again soon on my way to carry site inspections in Sabi Sands and Kruger NP. Looking forward to it, and you reminded me why! Thanks Jordi and so glad we share this love of SA! Thanks for bringing back memories of many happy trips through Mpumalanga, both with my parents and brother and then later with my husband and his late sister. Harries Pancakes in Graskop remains one of my favourite places to break the journey – and there’s another in Dullstroom too. 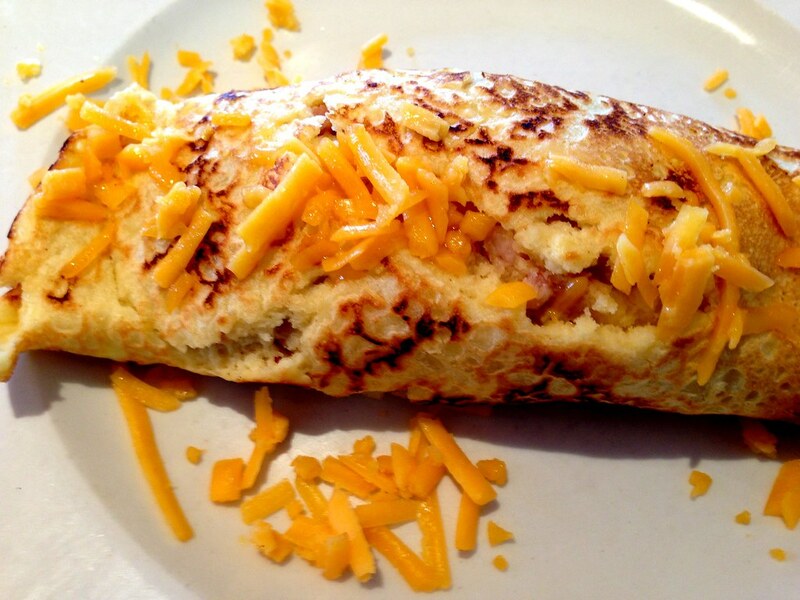 After your discovery of Cape Malay food, did you try the bobotie pancake?! I am slowly compiling info on Africa for some long-term travel thru the continent — and I had not heard about this route — so thanks!!! It looks beautiful and amazing. NGALA Safari Lodge in the Timbavati reserve to travel on the Panorama Route on our way to either the Savanna Lodge or the Earth Lodge in Sabi Sands. We have two options. One we drive the route with fewer stops along the way and make it into the gate before it closes for the night. And second we drive the route with more stops along the way and not make it to the gate and have to overnight at a place called Lone Creek River Lodge. Then make entry into the gate the following morning. Thus we would lose the morning game drive at whatever lodge we end up chosing. Well we did the speedy version of the drive actually. 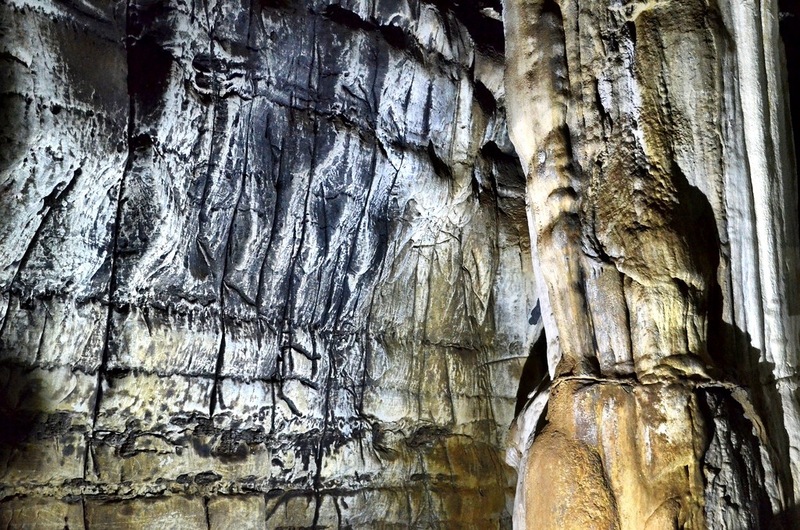 We flew from Joburg to Kruger airport then visited Sudwala caves and started the drive. We stopped in Gradkop for a late lunch before making it to God’s Window for sunset. We overnighted nearby and then the next day went to Bourke’s and the 3 Rondavels and then drove to Kruger and barely made it for the sunset safari. Please note, this is a very tight time frame and you may want to break it up even more. Hi thanks for the post. I am planning to visit this area in September. I am little confused as to where to begin the journey. I will be finishing the garden route and planning to fly to Hoedspruit. Then do a half a day and then do the other half the next day. Is this the right way of doing and since I love photography I like your comment about seeing God’s Window during sun set. Can you help me what is the best way to do the full Panorama route.